This is the second German edition of The Dark Wind. This is the fifth novel in the Tony Hillerman Navajo Mystery series. This edition was published in 1989 by Rowholt Taschenbuch Verlag GmbH in Hamburg, Germany. This edition is a RoRoRo Paperback Thriller, which was the first inexpensive paperback series to be published in Germany. The concept of printing inexpensive paperback versions of popular books was imported from America to Germany in the 1950's. 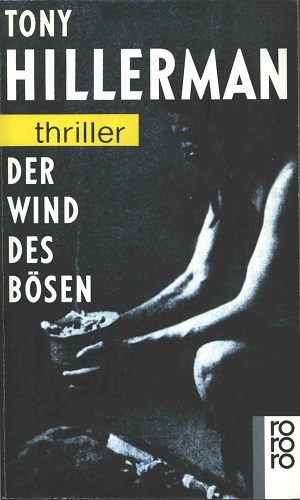 This edition of The Dark Wind was translated from English to German by Klaus Fröba, and the title translates to "The Wind of Evil". This edition was edited by Jutta Schwartz. The cover art was designed by Peter Wippermann and Nina Rothfos. The cover features a black and white photograph of a Native American man holding a presumably ceremonial pot. Format: Paperback, 19 x 11.45 cm. Binding: Paper cover with black-and-white photograph. Text in white, with short band of yellow highlighting the word "thriller." On the binding THRILLER 2849, the title, the author, the number 780 and rororo are printed vertically in white.